Classic gadget the Teasmade – an icon of the sixties and seventies – has been redesigned, and is now in stock at John Lewis. 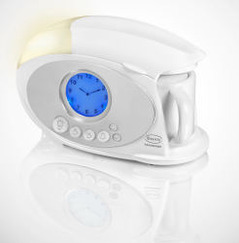 Cunningly combining an alarm clock and a kettle, the idea is simple: Teasmade times the kettle to have a cup of tea ready for you by the time the alarm goes off. Now made by Swan, the Teasmade of 2009 features a new sleek, contemporary and compact design, large 600ml water capacity, rapid boil function, integral reading light and illuminated LCD clock. It means you can’t throw your alarm across the room without getting boiling water on the floor/cat. But maybe you’ll wake up in a good mood anyway because of the gently wafting tea aromas.